THURSDAY Nov 28 – RACE DAY: Race start is at 8 am so we would need the crew to show up at 6:00 am so we can get people into place for race start. The event will end at about 10:00 am. Volunteer duties include water station help, finish line help and post race expo cleanup. Please arrive on time and report to the main checkin tent or main statge and ask for Bill Escobar (race director). Please add this email to your trusted emails list, bill@elitesportsca.com you will be receiving event updates and other important event info prior to race day. 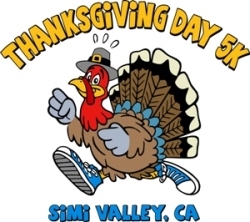 Start at Rancho Simi Park and run along the Arroyo bike path that is lined with beautiful trees for shade and runs through the center of Simi Valley and along the Arroyo Creek. This is still home to ducks and herons, (AKA- not cranes), who are soaking up the sun while playing in the gently flowing spring /summer time water. There will be Aid stations every 1.5 miles. Yes, this is a very walker friendly course! It is mostly flat, with a few gentle rollers to keep you on your game. There are plenty of aid stations, and this event is loads of fun!